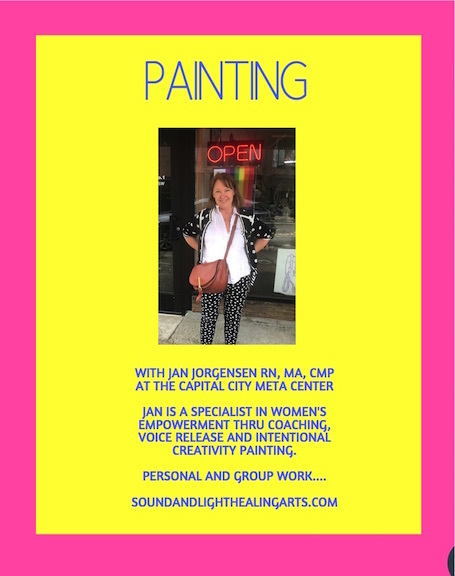 Painting is now incorporated into the Sound, Light and Color Healing methodologies of Sound and Light Healing Arts! 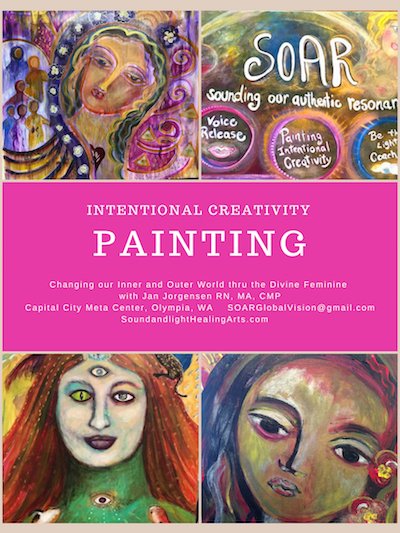 We are incorporating the beautiful Intentional Creativity methods of the Color of Women Program. 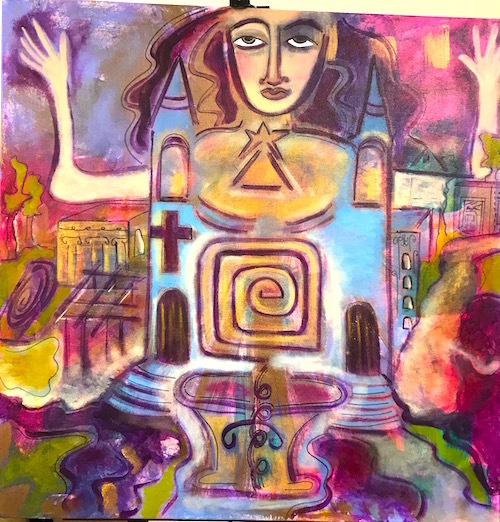 View the Gallery of Jan’s Paintings here and feel the energy they emit! Access your deep inner seeing and bring forth that which you see with your Divine Eyes. We simply make an “intention” and write it on the canvas…and then express ourselves thru simple guided layers to un-earth a NEW Story! A sacred ritual. See it in action in the videos below. Anyone can do this! You do not have to be a painter. It’s experiential!!! Stay next door at the Governor Hotel and take a shuttle from SeaTac airport….easy! ….are a joyous expressive experience. We gather in Sacred Circle and find our intentions within our hearts for personal change. Or perhaps focus in on a much needed change for the world or our community. We can shift things through our thoughts and then painting. 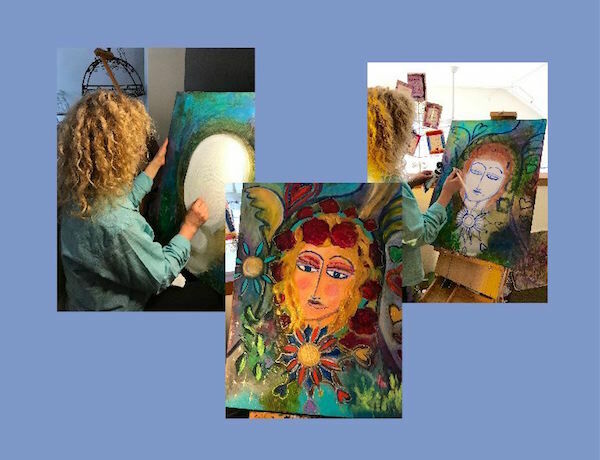 Or have a personal healing session AND painting session…big healing. Expressing yourself thru ART is healing. For you and for the planet. 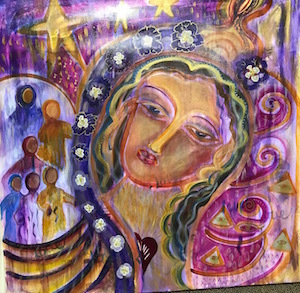 We use a sacred space concept of accessing your inner knowing and painting with our intuition and moving thru 13 steps of Intentional Creativity developed by Shiloh Sophia and the Color of Women Program. A moving, transformative experience within a container of safety. All sessions are held in person at 119 Legion Way SW Olympia or we can meet on the internet in the “Zoom” Conference room. 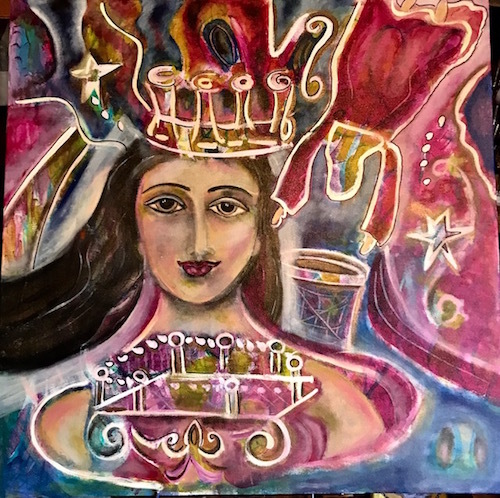 Chartres Lady of Truth…see it in process at this link! You can make a meaningful masterpiece in 6 hours…see the painting above..it just pours out! Watch this to see what our first-time painters created!!! learn how to express your inner world thru paint. and WHAT do the STEPS look like?? You begin with an intention and then go thru steps to articulate your feelings, dreams, visions about this subject or issue. Things begin to resolve…then congest, then resolve and at the end you have been through a very transformative JOURNEY!!!! See the images below and how it all unfolds. Between “layers” of painting many more feelings and ideas come up related to the issue. See the last right photo is not quite finished but she has her infrastructure comple…she still needs more face highlights. But you get the picture!! This method is used therapeutically in Hospitals, Hospices and with all types of groups. Imagine a work group bonding through this experience of painting together. Somehow the resultant painting is more than just a painting. It is a piece of ourselves…our history AND our hopes and dreams. There is just something so powerful when we enter the world of intentionality. Miracles happen. Things shift. The colors have power but it is our own inner psyche that is re-created thru self expression. 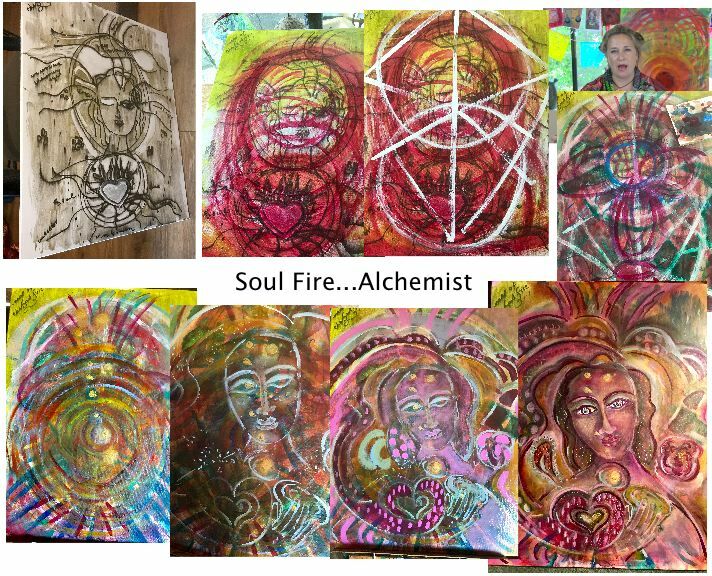 The Steps of Intentional Creativity….This is my painting and upper right is the Master Teacher of Intentional Creativity Shiloh Sophia! !